Some of the earliest liquor bottles were square in cross section and generally designed to contain gin though undoubtedly contained various types of liquor and possibly wine. Commonly called 'case gin' or 'taper gin' bottles since they would pack more efficiently in a case (6 to 24 bottles) than round bottles. Case gin bottles are square with a distinct taper inwards from the shoulder to the base. The neck is very short to almost non-existent with the finishes varying from a laid-on ring, flared, mineral finish, oil, and even a blob. This shape and style of bottle originated in, and was commonly made in, Europe at least as early as the mid-17th century. 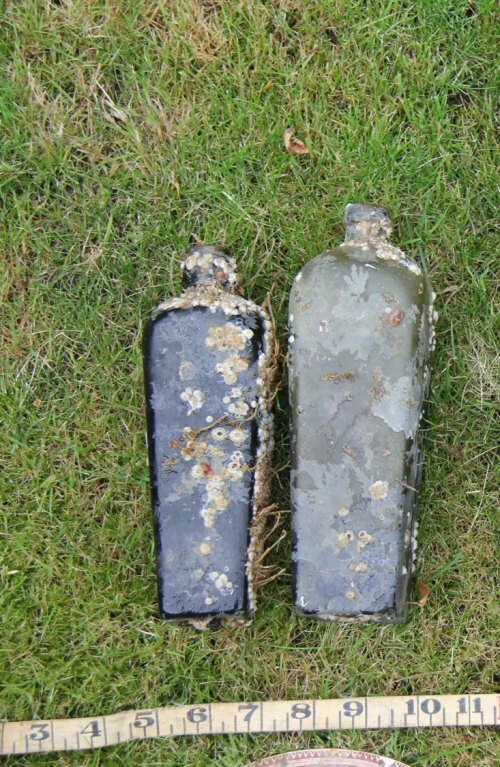 These examples do not exhibit the bevelled corners generally seen on bottles of the 1860s or later (Historic Glass Bottle Identification & Information Website, accessed November 2017), and may therefore be earlier 19th century. This items was found with three cylindrical glass bottles​ (MAS-D100084), seven clay pipes (MAS-D100085) and the lid of a ceramic serving dish (MAS-D100087).